How much does it cost to create technical documentation, especially software documentation such as user manuals, online help, and screencasts? How much time does it take to create technical documentation? How can the costs be estimated reliably? User-friendly technical documentation (software documentation, software user assistance) makes your clients happy and minimizes your support costs. My goal is to identify the optimum balance between these benefits on the one hand and the money that it costs to create the documentation on the other hand. Good documentation is expensive—having poor documentation is even more expensive. Certainly you’d like to see some precise figures here. However, as projects can be very different, it’s hard to establish a general rule. For a professionally made screencast (software video), the time required for storyboard development and production is about 1 up to 3 hours per minute playing time—heavily depending on the product and on your quality goals. My rates are based on the specific professional requirements of a project. Please feel free to ask for an individual quote. My quotes are always based on realistic estimates, not on best-case scenarios. Of course, I only charge for the hours that were actually spent on the project. By the way: You shouldn’t trust any offer based on a price per page (the only exceptions: translations and proofreading). It’s much more user-friendly, but also much more challenging, to present the same information on “only” one page than to fill a number of pages in a hasty action. Any price-per-page offer seriously penalizes user-friendly documentation and results in a conflict of interests. I calculate times on the basis of 15-minute time intervals. So you don’t have to pay for any expensive rounding-off errors. I provide the same terms and conditions to all clients, regardless of whether they are start-ups, mid-sized companies, or large corporations. If your project is on a tight budget, we can find a smart solution that uses this budget wisely. For example, we can run an ABC analysis to pinpoint priorities, and we can then use the right tools to create the documentation efficiently. ▪A cheap, inexperienced technical writer needs longer to create your documents. Often, this already eats up any assumed savings. ▪An inexperienced technical writer costs you and your staff more time. You need to answer more questions and you need to correct more mistakes. Both costs money, too, and it can become nerve stretching. ▪Low-quality technical documentation doesn’t make your customers happy and thus results in fewer sales. ▪Low-quality technical documentation increases your support costs. ▪An experienced technical writer can write concise documents that are much shorter than those of an inexperienced technical writer are. This makes readers happy and lowers printing costs. What’s more, it also saves up to 30 percent of translation costs. 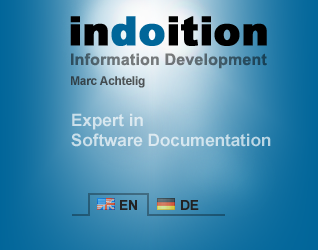 In the end, cheap documentation can become quite expensive.